Atom Tickets gift cards make the perfect gift for every occasion and for every movie-lover! Atom Tickets is a movie ticketing app and website that allows you to buy movie tickets in advance, invite friends and skip the box office lines at thousands of theaters nationwide. Use Atom Tickets gift cards to purchase tickets for theaters including AMC Theatres, Regal Cinemas, Harkins Theatres, National Amusement’s Showcase Cinemas, Southern Theatres, Landmark Theatres, Bow Tie Cinemas, ArcLight Cinemas, Studio Movie Grill, Emagine, Megaplex Theatres, Silverspot Cinema and many others! Atom Tickets makes it easy to plan a movie outing with friends and family, and to find the perfect movie with showtime listings and digital ticketing at more than 20,000 movie screens nationwide. Select theaters even let you pre-order concessions so you don’t have to wait in the snack line! Atom Tickets gift cards are redeemable via the free Atom Tickets app or online at www.AtomTickets.com. Cards cannot be redeemed in person at the theater box office. Gift cards have no expiration date. Download the Atom Tickets mobile app or visit Atom Tickets online. Acceptance of this card constitutes acceptance of these terms and conditions, which may change at any time. To view your eGift Card balance, go to www.atomtickets.com/giftcards. This eGift Card does not expire. 1. 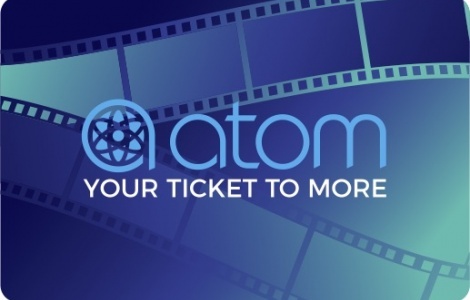 Shop for movie tickets using our mobile app or online at https://atomtickets.com. 3. Enter the PIN number and complete checkout.